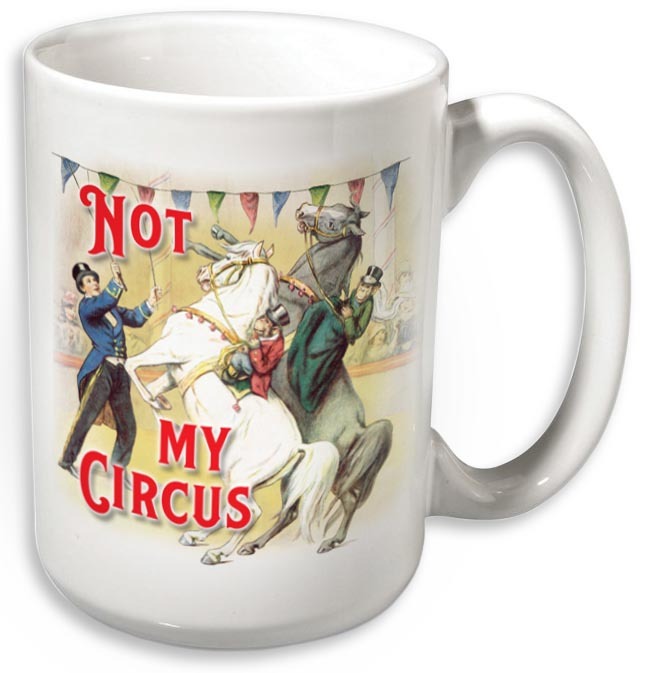 14 oz white ceramic mug imprinted on the front: Not My Circus, and on the back: Not My Monkeys. Features vintage circus art of horses and monkeys. "Over the years I have found myself being sucked in to all kinds of drama that I had no business being in. There were so many times when I caused myself unnecessary stress by worrying about something that didn’t concern me. It takes a lot of strength to pull back from things that are going on around you, but I urge you to try! 1. Does this situation really involve me? 2. If the situation doesn’t really involve me, what is my motivation for getting involved? 3. What will it cost me to get involved? We’re talking time, money, stress, etc. 4. Can I really bring something to the table that will help all parties get to a better resolution? 5. What will happen if I decline to participate in this situation?"